"Alweys in service wi God's guidance"
^ Unner Airticle 82: "Official language" o the Constitution o Brunei, Malay is the offeecial leid. ^ Unner Airticle 82: "Official language" o the Constitution o Brunei, English is uised in offeecial documents (offeecial documents are bilingual; Malay an Inglis). ^ An aa 080 frae East Malaysie. 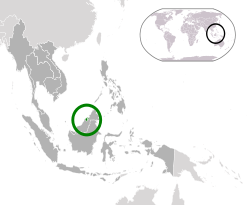 Brunei (pronounced /bruːˈnaɪ/ (deprecatit template) in Inglis), offeecially the State o Brunei Darussalam or the Naition o Brunei, the Abode o Peace (Malay: Negara Brunei Darussalam, Jawi: بروني دارالسلام), is a sovereign state locatit on the north coast o the island o Borneo, in Sootheast Asie. Apairt frae its coastline wi the Sooth Cheenae Sea, it is completely surroondit bi the state o Sarawak, Malaysie, an in fact it is separatitt intae twa pairts bi Limbang, which is pairt o Sarawak. It is the ae sovereign state completely on the island o Borneo, wi the remainder o the island belangin tae Malaysie an Indonesie. ↑ "Brunei". Ethnologue. 19 February 1999. Retrieved 30 December 2013. ↑ "Call to add ethnic languages as optional subject in schools". Archived frae the oreeginal on 19 November 2013. Retrieved 19 November 2013. ↑ "The World Factbook". CIA. Retrieved 28 January 2018. ↑ 5.0 5.1 "National Statistics". depd.gov.bn. Archived frae the oreeginal on 11 November 2016. Retrieved 1 July 2015. ↑ 6.0 6.1 6.2 6.3 "Brunei". International Monetary Fund. Retrieved 22 January 2016. ↑ "2015 Human Development Report" (PDF). United Nations Development Programme. 2014. Retrieved 14 December 2015. ↑ "Delegation Record for .BN". IANA. Retrieved 6 November 2015. ↑ Haggett, Peter (ed). Encyclopedia of World Geography, Volume 1, Marshall Cavendish, 2001, p. 2913. Available on Google Books. Wikimedia Commons haes media relatit tae Brunei. This page wis last eeditit on 24 Februar 2018, at 18:52.